When he isn't giving it his all on the gridiron, first-year Bear Jared Allen is constantly making an impact off the football field as well. Allen signed a four-year, $32 million deal with $15.5 million in guaranteed money back in March with the Bears. He teamed up with Procter & Gamble and Walmart to help the veterans on Tuesday for Veterans Day. The 32-year-old Idaho State product ranks second among active NFL pass rushers with 130 sacks, including 1.5 this season with the Bears despite a bout with pneumonia where he lost over 15 lbs in early October. Allen has been helping the community and veterans who bravely decided to serve our great country for over five years now. Through his foundation, Homes for Wounded Warriors, Allen helped Chicago veterans along with the support of the Eddie Beard Homeless Veterans’ Housing Program (Vet House). 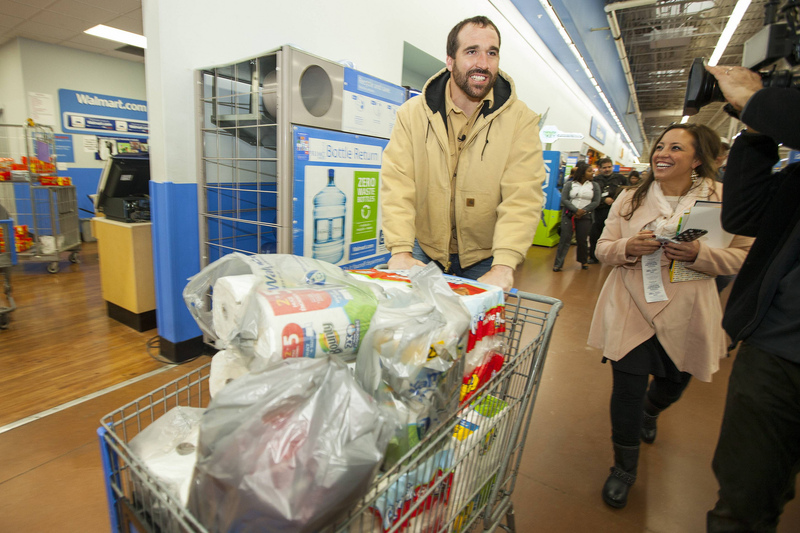 Allen then went to a local Walmart on Tuesday to stock up on P&G products for the Vet House. Those products included a year-supply of much-needed products, Bounty®, Oral-B®, Old Spice®, Tide®, Crest®, Scope®, and Charmin®. "Supporting veterans is something I do on a daily basis through my Foundation, Jared Allen’s Homes for Wounded Warriors. It was the perfect fit," Allen said. "Through my partnership with Procter & Gamble, and this program with Walmart, I was excited to learn about a local nonprofit that helps veterans find permanent housing and establish an income. Veterans Day was a perfect opportunity to shine a light on this program while recognizing all of our veterans for their service." Allen admits that he "saw a need for these wounded Veterans" as a big reason why he started his foundation in 2009 after arriving home from a USO Tour. "They weren’t necessarily getting their needs met. I came up with the idea of building homes or retrofitting them for their needs. The reaction has been great," he said. "We have been able to get some great partners and we continue to grow each year which allows us to build more homes. The work takes place all over the country. We just help where there is a need." Prior to landing with the Bears this off-season, Allen spent his previous 10 seasons terrorizing quarterbacks. He totaled 85.5 in six seasons in Minnesota, including a career-high and Vikings single-season sack record 22 in 2011. Before that Allen generated 43 sacks in four seasons for the Kansas City Chiefs, the team that selected him in the fourth round of the 2004 NFL Draft. On Sunday, the Bears (3-6) will take on Allen's former team at Soldier Field for the first of two meetings on tap this season. Allen earned four Pro Bowl trips with his old squad and was wrecking havoc with the Minnesota just recently with 11.5 sacks in 2013. When asked what this reunion means for him personally, here's what Allen had to say. "It will be fun playing against my friends that I still have on the team," he said. "I spent a lot of time in Minnesota and I look forward to going back." Playing previously in towns like Kansas City and Minnesota don't really compare to the legacy and history in the city of Chicago. Allen understands that history and really relishes it. "All of the great players that have played for the organization is really cool," he said. "There is a lot of great history with the Bears organization. My favorite parts of the city are the great restaurants." Allen, who grew up outside of San Jose, Calif. in a small farming town called Morgan Hills has been an avid hunter since he graduated from Idaho State. He admits he hasn't really gotten into one of his favorite pastimes since making the move to Chicago for a couple of reasons. "I don’t get out much these days because I am a father for the second time," he said. "My children and wife are the priority so I haven’t had much time to hunt like I use to." Allen missed the first couple days of training camp in Bourbonnais due to the birth of his second daughter with his wife Amy. Despite the low output in the sack category, Allen has two games with seven tackles this season giving the Bears' run defense a boost. Allen has made appearances on hunting shows for his talents spear knifing elks and ironically bears, but I guess he doesn't have an interest in pursuing an acting career after his playing days are over. Left, Jared Allen (6-foot-6, 270 lb Chicago Bears defensive end), right, Rob Riggle (6-foot-2, actor and former Marine Corps Lieutenant). 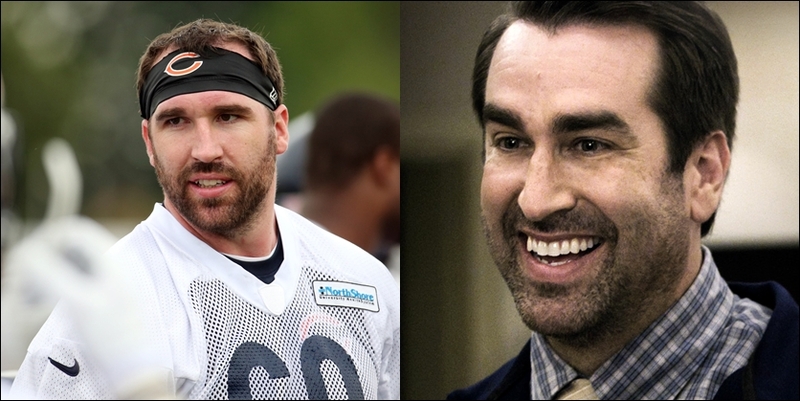 Personally I think Allen would make a solid actor after watching him in post game interviews often this season with the Bears. Actor Rob Riggle, whose had roles in comedies The Hangover, 21 Jump Street and The Other Guys reminds me a lot of Allen. You can say he is Allen's doppelganger. However, Allen wasn't too sure what to make of the comparison. "I have never heard of that comparison before," he said. "I am not too sure who Rob Riggle is. And no I don’t think much about becoming an actor." Strangely Allen hosted a charity golf tournament called "Night-Ops IV" in 2013 and Riggle was among many celebrities and NFL players who took part in the event. Here's the full press release regarding Allen's involvement with P&G and Walmart for the Vet House. Don't forget to keep sharing and liking Bears Backer on Facebook, Twitter or the comment boxes below on the latest stories to have a chance at winning a New Era Bears hat. Winners will be announced Thursday and Saturday night.